My name is Aubri Tallent. My son, Lukas, was in the NICU for 6 weeks after his birth as a result of Hypoxic Ischemic Encephalopathy, brain injury and seizures. He came home with a feeding tube and we weren’t given much encouragement to get him off of it. 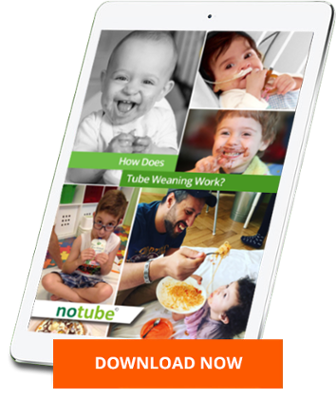 When I first contacted the amazing people at notube.at, I was not convinced that my son was even a candidate for tube weaning. We had tried to teach him to drink a bottle for months before we began the Netcoaching program, with limited success. By the time we began weaning through the Netcoaching program, we had gotten Lukas to take about 20 ml of milk at a time, but it took him about an hour to do so. We couldn’t see how he would ever be able to drink enough to sustain himself without the tube. Though it was an incredibly difficult process, emotionally, it only took Lukas 2 weeks to go from full tube feeds to being tube free! It has now been more than a year since his tube came out and he is still eating like a champ! He takes all of his milk orally and is even eating increasingly thicker and chunkier baby foods as well. He is consistently above the 50th percentile on the weight charts and we have even seen his development improve since the tube came out. All in all, we are so incredibly grateful that we found the tube weaning program at notube.at and for all of the support and encouragement we received from everyone there.